Ever since going low carb, have you missed eating sushi? 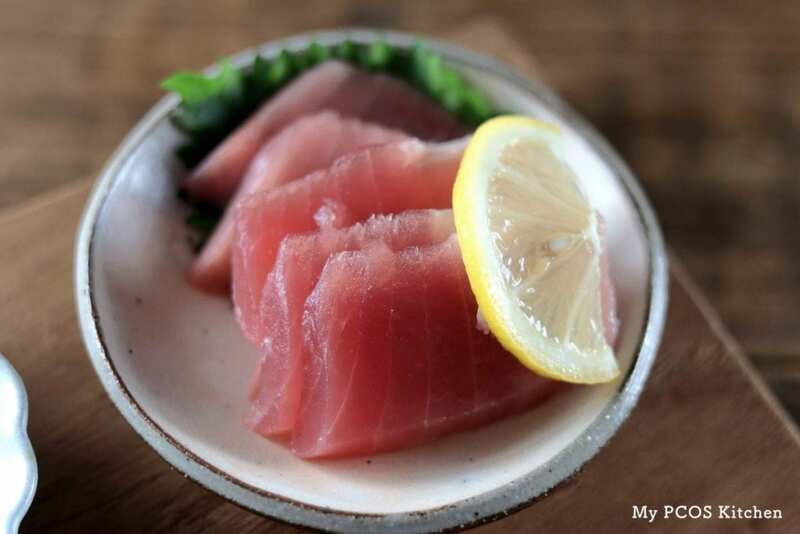 I actually love making sushi and eat sashimi on a weekly basis so this recipe is a common part of my diet. I prefer making sushi with cucumber because I think it tastes better than sliced zucchini. 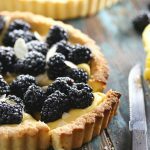 Making it with an avocado cream helps the fillings inside stay inside. 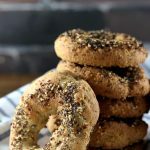 You could also put some softened cream cheese, but I wanted to keep this recipe dairy-free and I prefer sushi without cheese. In Japan, they sell packs of sliced fish (sashimi) at the grocery store so you can make your own sushi at home. The pack that I bought came with different types of fish: salmon slices, tuna slices, sea beam slices and ground tuna. I had some leftover tuna slices so I just ate those as sashimi! In one sushi, I put some salmon slices, onion slices, egg omelette, ground tuna and wasabi. 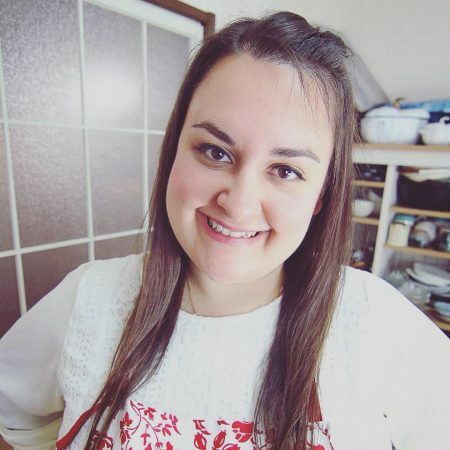 If you would like to know how to make a Japanese rolled omelette, check out my recipe here! 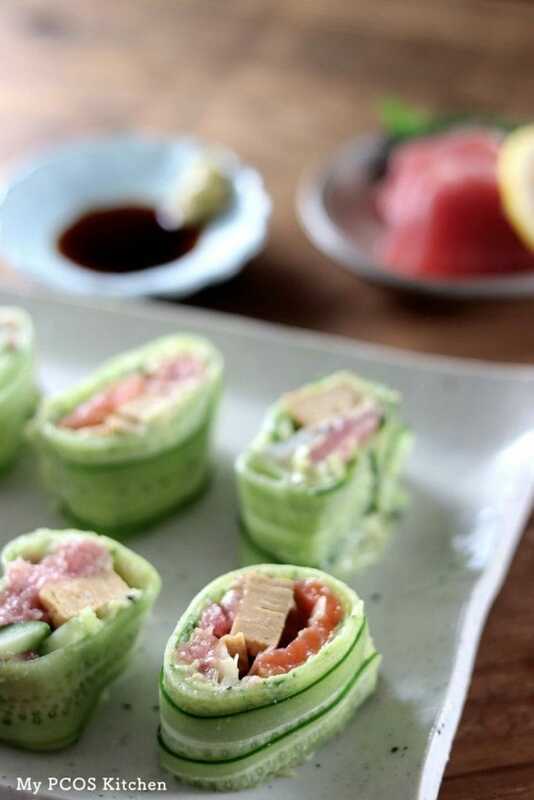 In another sushi roll, I put some sliced tuna, sea beam, rolled omelette, cucumber sticks and wasabi. 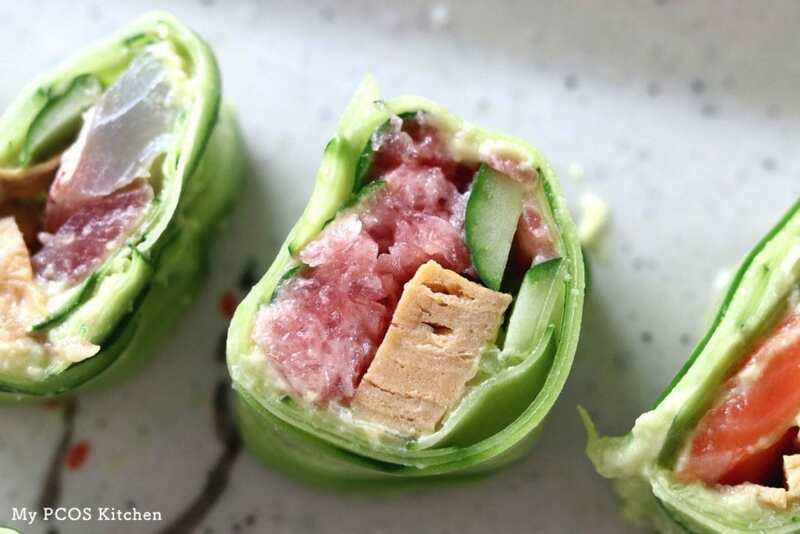 In the last roll, I put ground tuna, cucumber sticks, sliced onions and rolled omelette. Mash the avocado and combine it with the salt, pepper and mayonnaise. 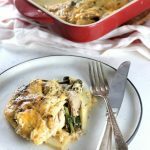 Make sure it's mashed properly and very creamy. The smoother it is, the easier it'll be to spread over the cucumbers. With a vegetable peeler, thinly peel the cucumbers. Put some saran wrap over a cutting board. 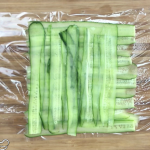 Arrange 8-10 cucumber slices slightly overlapping each other horizontally over the wrap. 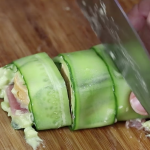 Put another layer of cucumber slices vertically so that it covers the horizontally ones perfectly. Line up vertically all of your preferred fillings on the right or left side. This could be sliced fish like salmon or tuna, cucumber or carrot sticks, cream cheese, onions, avocado, etc. You can also put some wasabi in there if you like your sushi spicy. Turn the cutting board 90 degrees so that the filling is facing you and you will roll it forward. 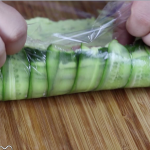 With the help of the saran wrap, pick up the cucumber sushi and slowly roll it forward applying a bit of pressure. This is compressing the sushi so that it holds its shape. 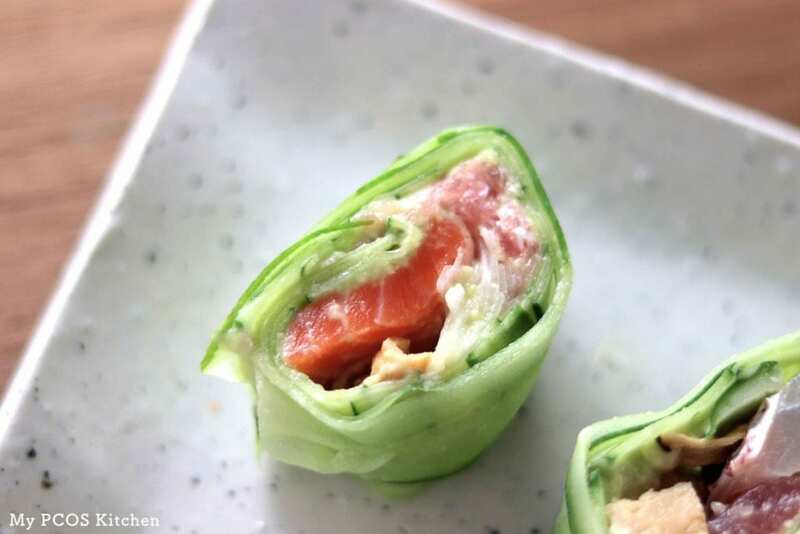 Once rolled, carefully remove the saran wrap around and slice the sushi into even pieces. In one sushi roll, I put ground tuna, cucumber sticks, thinly sliced onions, sliced Japanese rolled omelette and wasabi. 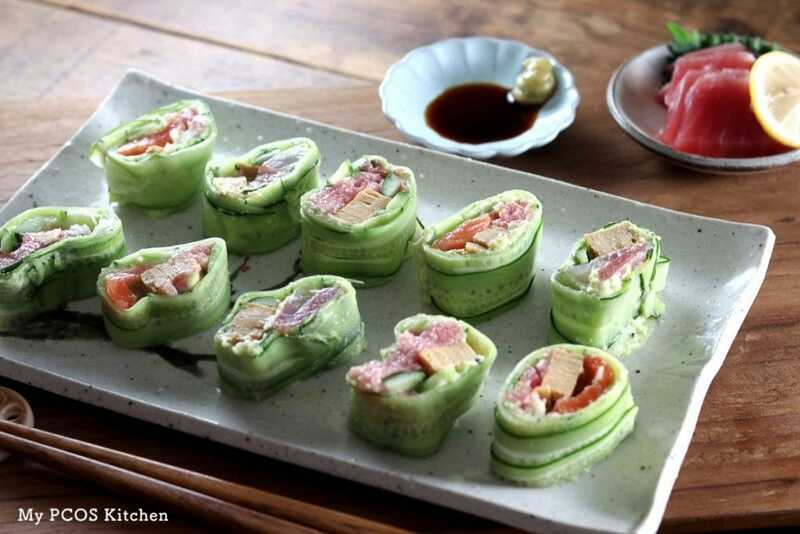 In another sushi roll, I put sea bream, tuna, cucumber sticks, sliced Japanese rolled omelette and wasabi. 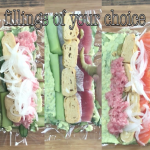 In the last roll, I put salmon, ground tuna, sliced onions, Japanese rolled omelette and wasabi. I did not put any nutritional information for this recipe because what you put in the sushi will depend entirely on you. The size of the cucumber too will also differ per person. 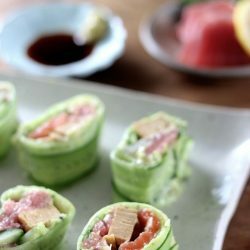 Looks like a great alternative to “normal” sushis !